The ancient myths and legends are so crazy to modern humans they seem totally made up. But why would all civilisations around the world create the same mad stories of planets as gods fighting and destroying each other? How come around the world we have basically the same stories and gods? Unless everyone witnessed these events. It is unlikely that the whole world made up these stories and built temples, cultures, legends and their own history around made up stories. These are the same people who built the ancient wonders and had such advanced knowledge. All the ancient myths and legends seemed unexplainable to our world. Was this because our world is very different to the one that the ancients lived in? Are myths and legends Symbols of an Alien Sky? David Talbott has been studying mythology for many years. The video he has produced called Symbols of an Alien Sky follows on from his work with incredible and life changing Thunderbolts of the Gods (youtube or full version on googlevideo) and his earlier film Remembering the end of the World. The basic idea is that why did our ancestors give godly and terrible powers and stories to the planets? Especially as they are so far away and have nothing to do with us? Unless in our past they were things to fear and did bring devastation to the Earth. As crazy as it sound the visual and historical evidence is very convincing and as you get further into Symbols of an Alien Sky it seems as if his theories have stronger proof. There are 3 ten minute samples of the Symbols of an Alien Sky video available on youtube. Egyptian mythology - detailed, good explanations, lots of images to back up his ideas and theories. Great site by author Gary Gilligan who has a couple of catastrophe mythology books. I have not read the books yet so can not review them but I will certainly get them soon. The God King Scenario (GKS) deems that the monarchy of ancient Egypt were first and foremost guises of primarily Mars, Venus, Mercury and the Moon as they appeared to repeatedly move back and forth to Earth (from Earth's POV) in cosmic encounters lasting 3,000 years (Pharaonic Egypt). They were in the second instant represented here on earth numerous times over by people who believed they were ‘at one’ or the earthly manifestation of astral bodies. One good example of his research but also a case of "What dont you see?" is about Re (Ra) the Sun God. 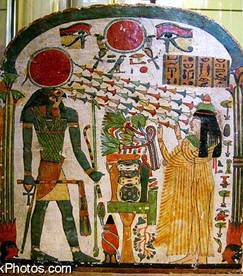 Ra was the Egyptian Sun God yet he is shown as a red disk? Why not yellow? Unless he was not yellow. And for those who will read to the bottom of his article you will find a real treat and eye opener. A section called "Where’s the Moon?" His page of links for Geological Evidence is also worth a view. 'Plasma mythology' explores in what ways ‘plasma phenomena’ in near-earth space are reflected in human myths, rituals and artefacts ranging from stone circles and petroglyphs to pyramids, sculptures and mythical writings. Mythopedia is a site run by Marinus Anthony van der Sluijs who, amongst other things, also contributes to thunderbolt.info TPOD's (Thunderbolts Picture Of the Day). One example of his work is the TPOD "Space Tornadoes Cause a Stir". His work is based on detailed research but also many field trips around the world. Mythopedia contains the outlines of his work, ideas, sources and history but it does not have a lot of articles on it. For his ideas and work you need to read his TPOD articles and there are a lot of them. A few examples include The Flood from Heaven, The Winged Disk, The Feathered Serpent, The Mountain of the Gods. van der Sluijs TPOD articles really do explain mythology from an Electric Universe point of view. He also has a few books out, a couple being "The Mythology of the World Axis - Exploring the Role of Plasma in World Mythology" and "The World Axis as an Atmospheric Phenomenon"
The thunderbolts.info sites has a TPOD (Thunderbolts Picture Of the Day) that is essential for anyone interested in the Electric Universe Theory. They also regularly have TPOD articles on Mythology from an EU point of view. One example of an Mythology TPOD is quoted below. Re: Myths and Legends explained in an Electric Universe? That the smaller Solar System bodies - Mercury, Venus, the Moon, Earth and Mars were on very different and unstable orbits only a few thousand years ago, is undoubtable to me. This means that our ancestors went through difficult survival experiences. This has affected our genetics and epigenetics. Consequently the understanding of these past experiences stands out as extremely important to humanity. Yet attempts to get discussion groups going have not met with much support. Perhaps my style is not conducive to such discussions, but nevertheless I feel I must support any attempt towards such discussions. The Tree of Life or The Tree of Death? One of the problems and issues when discussing Plasma Mythology and the changing planets micro system is explaining the period when the planets changed orbit. People can see the Squatting Man and Tree of Life as having a lot of factual (historical and pictorial) basis. The issue that Mo has raised about the survival experiences really needs to be investigated or explained further. It is related to the question why is it called the Tree of Life if catastrophe is associated with it? Maybe David Talbotts "Symbols of an Alien Sky" has helped to start to clear it up, if the Polar Configuration theory is correct? The Golden Age was in conjunction with Sun we have today, which I did not realise, causing the crescent image on Saturn that has been interpreted by historians as the crescent moon. So when the Polar Configuration separated the Earth was still heated by the Sun? The issue here is that the orbit of the Earth must have been on a different orbit than today, so was the Earth much colder or hotter than today, did this cause one or all the Ice Ages? How did humans survive the transition? If the Earths heat is not totally depending on the Sun but its own transformation/creation of electrical energy from the Electric Universe then this could help keep the Earth warm enough. Basically does the Earth create some of its own heat/energy and is therefore its own engine/heater? What are the other ideas on different planetary configurations and changes? The fact that catastrophe did hit the earth is in no doubt to anyone, it is just a matter of what you think caused it. Comet impacts, Super Volcanoes, EU catastrophe... The world’s mythology backs it up but so it seems does science and the human DNA bottlenecks that appear in our history. Although the dates will be argued by many EU people these population bottlenecks appear to have happened. What I found fascinating is the fact that one of the Plasma Mythology events is called "The Tree of Life". If it causes such catastrophe and devastation to the earth why would you call it The Tree of Life? * The radiation from it changed the DNA of life forms on Earth. This would explain why humans have changed suddenly, why new races have appeared. There is no missing link because we are the missing link. Humans did not "evolve" as such they just mutated very, very quickly into another form. This may also help to explain why we have such distinct different races (pdf) on earth. Each one is very distinct from the other. Regarding the Earth getting too cold in an elliptical orbit, perhaps the Earth nearing the Sun, in the vicinity of Mercury or Venus, would have not only produced a lot of evaporation and precipitation at the poles, but also some electrical effects that produced a lot of dust, especially from volcanoes. And this dust served to keep the heat in when the Earth was far from the Sun. Also much heat, from the close approach to the Sun, could have been stored at great depth and it would take possibly years for this heat to work it's way to the surface and be radiated away into space. The missing links may be explained by most life not leaving any evidence of it's existence and fossils only being formed under catastrophic circumstances. Unfortunately the 'different races (pdf)' didn't load for me, as I thought that the basic differences between races are mostly epigenetic, and therefore an outcome of adaption to the environment, which could have occurred relatively quickly. The planets were probably in a different configuration before a reorganization period. However, although the state of humanity in this previous planetary configuration is significant, the real issue for humanity is the effects of the huge dramas and general struggle to survive that our ancestors went through. Thus the work of Gary Gilligan seems likely to lead to an understanding of the reorganization period. Good point about the dust as it is found everywhere there is possible Electric Universe activity. More electrical energy you would suspect create more things like Volcanoes. How else would it change the weather that could help humans survive? The EU seems to point to the idea that the earth does get power not just through the suns heat but by its part in the electric circuit. Wallace Thornhill (also with David Talbott) in their radio interview (Thunderbolts of the Gods)with George Noory on Coast to Coast radio says that even if the earths orbit was 2 million miles closer to the Sun we would survive due to the electric power creating our weather systems. This part is mentioned starting around 3 minutes into this part of the interview. One interesting thing that is mentioned in this interview (part 5 and 6) is about the Electric Universe and humans being connected to it. Not just our body but our brain as a transmitter/reciever not just a processor. Information and memories stored in the ether and accessed through our brain, not stored in it. This article Where are our thoughts written? on hydrogen2oxygen .net explains the idea. Even if this is not the case would these times of catastrophe and great electric energy events and charges change our bodies and brains? Perhaps so we could either feel, hear or see stuff that we could not before. Even if it was just a change to the natural world would the earth and the planets start "singing" or making noises? Other effects would also be seen and felt. How could the plants and animals survive with the Earth in an elliptical orbit ? Most of the time in such an orbit would be far from the Sun with little light and cold to extremely cold conditions. Perhaps this is the reason that writers keep coming up with a Saturn System that orbitted the Sun somewhere near where Earth is now. Whereas it takes a lot less energy for the Saturn System to have been somewhere near where Saturn/Jupiter is now. And the smaller planets were scattered and mostly headed for the Sun. One wonders why the planets would have stayed in the ecliptic plane after a near interaction. Perhaps there is an electrical force acting on a planet that heads out of the ecliptic. 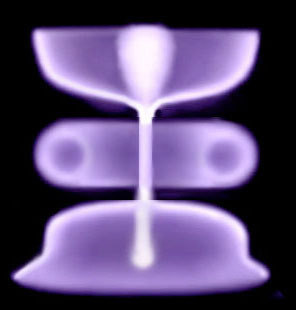 Then there is the possibility of this electrical force producing heating or light. Now if the planets are going everywhere in the ecliptic plane, how much electrical interaction would they have. The planets might have had much bigger magnetospheres than at present, because things were much more charged after the break-up. If so then there would have been heaps of electrical interactions which would have produced light and heat. Humans would have faced enormous stress and trauma, but could have survived the Earth being in an elliptical orbit. Experiments have shown that creatures under such stress undergo epigenetic changes, and these changes can be passed on to their children. Therefore we are all changed via traumatic experiences. Such changes are disease. Of course there was a lot of epigenetic changes through adaption to the new environment also. Understanding all this is required. I don't know enough about the changes in orbit from the EU point of view to work out what might have happened but I am open to any ideas about it that are based on sensible logic and reasoning. After all we will never be able to 100% prove what happened in the past, only offer alternatives to the Gravity only orbits. Epigenetics is a new term to me and it makes a lot of sense that these catastrophe events would change humans, not just their outlook on the world but physically and mentally. I would guess that there was a lot of energy being created by these events, not just synchrotronic radiation. A catastrophe would also undo a lot of mental programming, a massive shock or stress can break the mental thought processes you had before and allow someone to be re programmed or just forget everything they had been taught before. The classic examples are Pavlovs Dog and the flood, civilians who get involved in war and become murderous animals and of course 911. Before that day terrorists where white folk like the IRA but the days after with the relentless news coverage the world had been programmed to now see terrorists as Arabs. Is this another reason why we forgot or lost a lot of our advanced knowledge that we surely had? Apart from a lot of people being killed during these catastrophes you would presume. One thing I have found out is something called magnetic entropy, where amongst other things, the structure of crystals/cells do change under electromagnetic forces. It would seem very likely that humans and the very earth itself would have also changed during these catastrophes. How do you think the changes due to the stress and trauma would affect humans and the offspring? What would it do physcially and also mentally? "After all we will never be able to 100% prove what happened in the past,..."
Well those Egyptians probably recorded every event in the sky. The sky was just that important to them. How did they record an incident in a particular constellation. Which makes one wonder how they recorded exactly where in the sky an event occurred in the Saturn System. And so did the ancient Egyptians still incorporate the old system in their heiroglyphics. Perhaps we could do a group investigation of a particular subject - like Egyptian. Perhaps, 'when an event occurred' may be more difficult to determine than precisely where in the sky. Nevertheless if we could translate the heiroglyphics in terms of where-abouts in the sky, that would be a good project. "Is this another reason why we forgot or lost a lot of our advanced knowledge that we surely had?" It's better to think about the lost advanced humanity than trying to get the knowledge and power before we are healed enough to handle it. We would be advanced if we just lost the baggage that is retarding us. "How do you think the changes due to the stress and trauma would affect humans and the offspring? What would it do physically and also mentally?" Well soldiers going to war undergo stress and trauma and we have a good idea of the PTSD they suffer as a consequence. And it has been shown that the children of these soldiers are affected too. If there was a trauma that all of humanity went through, then we are all affected by it. So can we heal ourselves from the effects of something so ancient ? I guess we first have to accept that such a trauma happened and then we need to understand the trauma. What more is needed is not as certain as these first two things. So understanding our past is the go. First - I'm not so sure that a more highly charged planet would have a bigger magnetosphere. Egyptian used landmarks as representative of stars. So that the map of the sky was reproduced on the ground. Thus we have the Giza pyramids as Orion, but this fit is doubtful. So presumably when the Egyptians saw something in the sky then they found the position on the ground which was equivalent to the place in the sky where the event took place. Then I guess they built a monument and wrote hieroglyphics describing the event. It might be the Pharaoh as Mars and the Pharaoh's son as Mercury, and the story would be of the interaction of the two people. Then for the time we use the lists of Pharaohs and hopefully there are stories of each Pharaohs life. And if we had the time of year the event occurred then we must be getting close to getting orbital information. I guess you would either need to work out what was there original point of reference for all the kings (like the Greenwich Meridian and the Equator in our times) or work out each king as an individual and then try to put them together or work out the point of reference from there. One thing that would need to be looked at specially would be Akhenaten (Amenhotep IV) who when Pharaoh not just changed the official religion but also moved the capital from Thebes to Amarna (Akhetaten as it was also called). 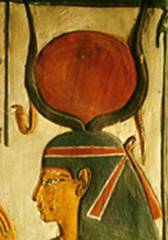 If we are looking for changes in the sky or in Egypt then Akhenatens change of Gods is interesting. Books seem to suggest he went from Amun-Ra (the creation god, breath of life...) to worship Aten, the Sun god. Why did he change to the one god and that god? One of the issues with this though is that if orbits have changed then how do you work it out? Or do you work out what they were saying, who they built them to, get a map of it all then see if that reflects what we see today or what peoples theories say the planetary configurations might have been? The fact that humans changed after catastrophes seems to be mentioned a lot, even though humans have a longing for the past, when the world, people and even the weather was better (be it 40 or 4000 years ago) there are a lot of mentions of the Golden Age, the Garden of Eden type places and worlds. Then catastrophe happened, the world changed, the sky fell on our head, we got kicked out of the garden. Then murder, death, disease and 9-5 working came into the world. I spoke to a German person who told me that one of the old bits of lore passed down to him was that the germanic people in the real old days were "peacefull" and not warlike. Then "something" happened, the sky fell on their heads and they became a warrior nation. Is this an example of Human Catastrophe Syndrome? So, if the world can accept what happened to us then we can start a world group therapy to heal ourselves and make ourselves and the world a much better place.